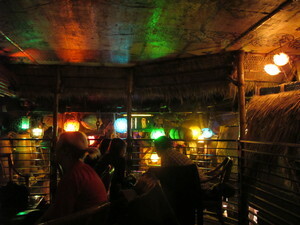 Next Tuesday March 23rd, ~SMUGGLER’S COVE~ is encouraging anyone concerned about the fate of the Tonga Room to swing by and sign a petition opposing the demolition of the city’s tiki palace to make way for a parking garage and luxury condominiums. After you sign the petition, of course you are encouraged to stay a while and enjoy a rum cocktail or two while you mix and mingle with like-minded people. Around 6pm, Chris VerPlanck and Erica Schultz of S.O.S. Tonga will provide a brief update on efforts to save the Tonga Room and exhort you to contact your local supervisors and the president of the Historic Preservation Commission, urging them to designate the Tonga Room as a local San Francisco Landmark. For more information, contact Chris VerPlanck.